While Chinese temples do vary, many tend to maintain a basic formula in regard to their layout. The iconography is always in-keeping with the traditional style and the same figures can usually be found in each of the halls. 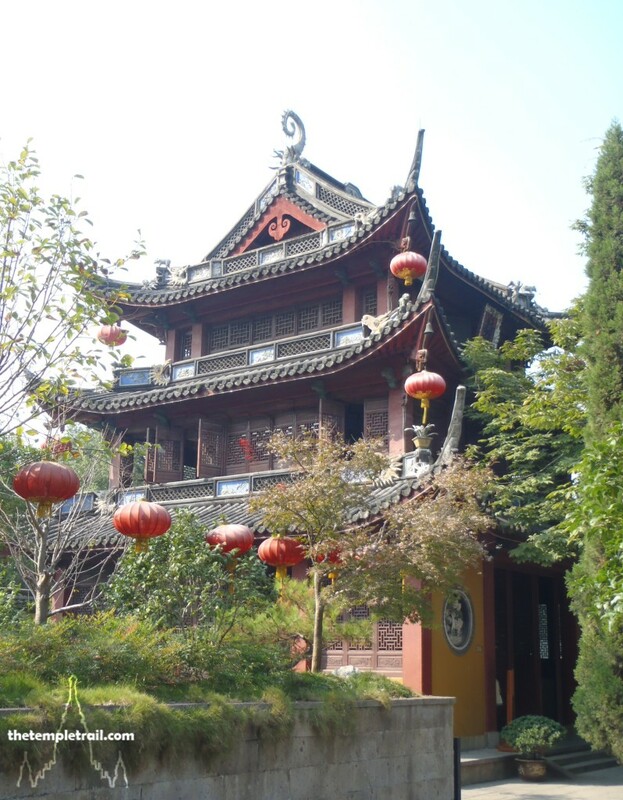 The generic temple is the main style that you find throughout China and in other countries with Chinese communities. 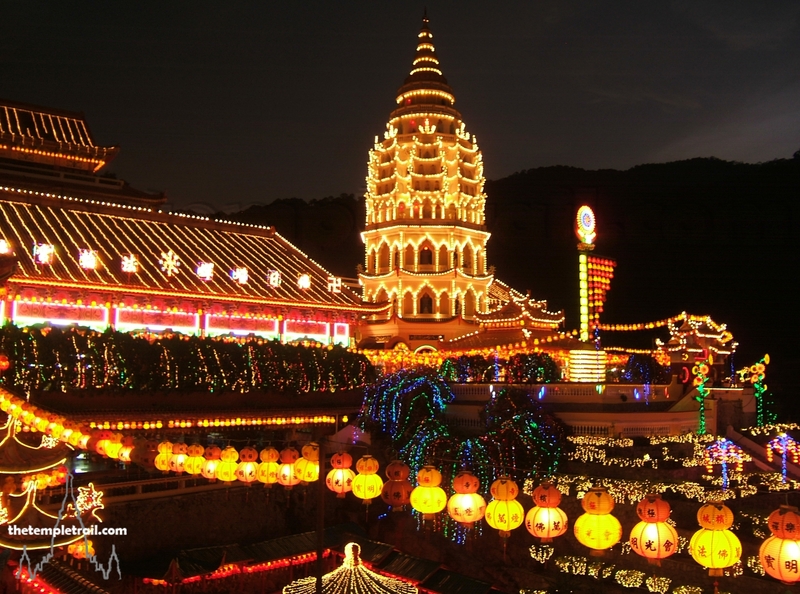 The Buddhist temple in China is a place that the community is built around. It’s a place for contemplation and prayer. You see the monks busily going about their tasks of cleaning the temple and chanting at prayer times. The smell of incense fills every inch of the grounds. 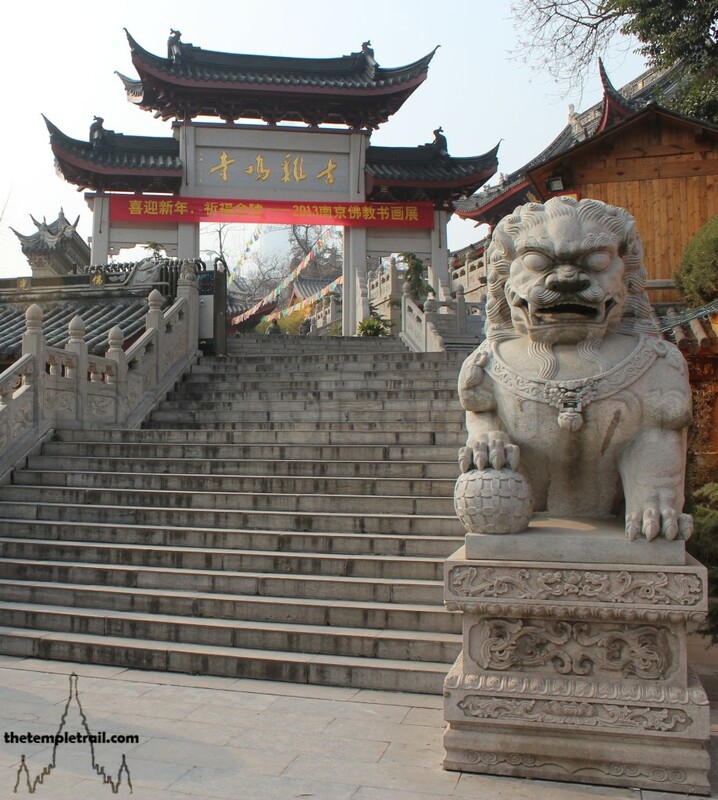 Some large temples have a symbolic gateway called a páifāng (牌坊) marking the beginning of the walk to the temple. This is a pillared gate that has no doors, but holds a placard announcing where it is you have arrived. They have multi tiered roofs and are purely decorative, having no practical purpose. A screen wall (照壁 zhàobì), or shadow wall (影壁 yǐngbì), is a screen that is placed at the front of the temple to stop ghosts or evil spirits from entering. The idea is that evil spirits cannot turn corners (hence the zig-zag bridges of Chinese gardens), and so the wall screens the main entrance. A temple may have a dragon wall. This is an aesthetic feature and projects the high-status of the temple to visitors. 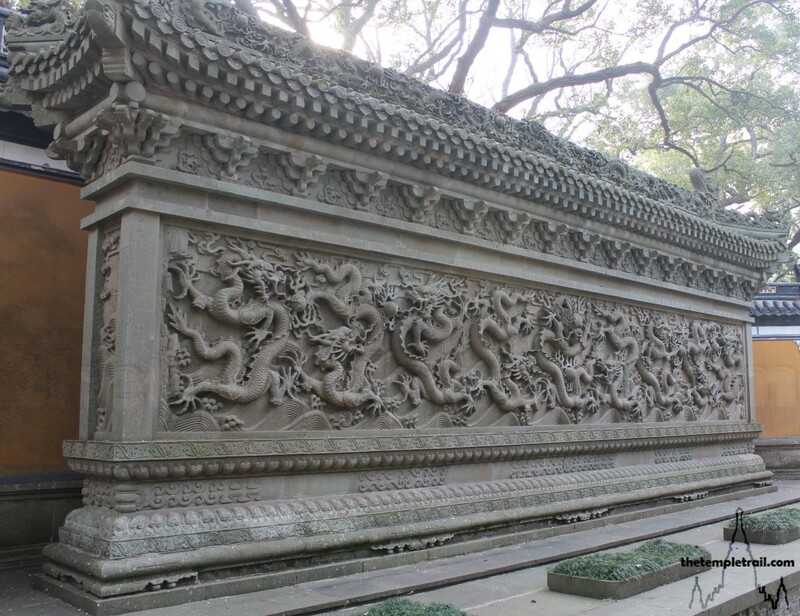 Usually reserved for imperial palaces, a nine dragon wall (九龍壁 Jiǔ Lóng Bì) indicates the imperial sponsorship of a temple. Larger temples will often have a gatehouse that you must pass through. This building has a heavy wooden door and might take you past grimacing temple guardians (哼哈二将 Hēng Hā Èrjiàng) that are symbolic avatars of Vajrapāṇi (金剛手菩薩 Jīngāngshǒu púsà), the bodhisattva who represents Buddha’s power. The statues symbolise the aum (beginning and end of all things), as one has an open mouth and the other a closed mouth. The open-mouthed Mìjī Jīngāng (密迹金剛) represents overt violence and the closed-mouthed Nàluóyán Jīngāng (那罗延金剛) represents latent strength. Often, the first courtyard of the temple, whether it’s the main courtyard or a smaller one, will have a tall round brazier in its centre. This brazier is not for burning anything, but is there to collect the coins that devotees try to throw inside it for luck. This building is the mirror image of the drum tower and sits on the other side of the courtyard from it. It houses the bell of the temple and is normally more significant than its counterpart. 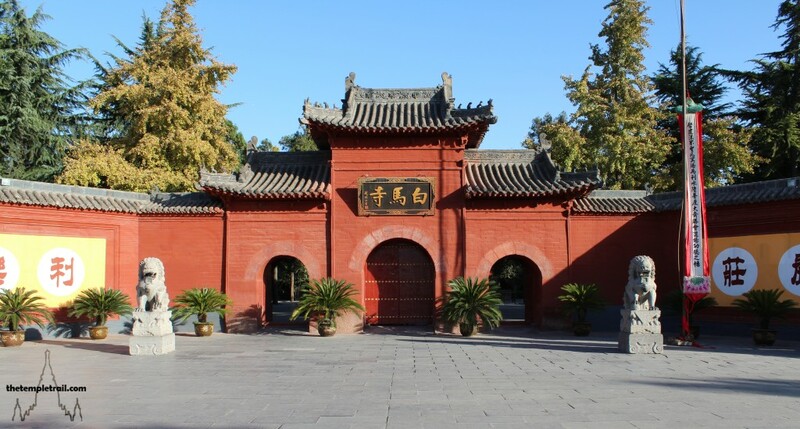 The first main building you come to in the Chinese temple complex is the Hall of the Heavenly Kings. This can sometimes be the first building in the entire complex if it is a smaller temple. The hall is named after the four directional gods it is intended to house. The square hall is often taller than it is deep and is a checkpoint through which you must pass in order to enter the sacred space of the compound. Passing through the large doors, you are normally confronted with an altar in the middle of the chamber. This altar has a statue of the sack-cloth monk Bùdài (布袋). He is a fat figure who is always depicted laughing, hence his nickname the laughing Buddha. He was a 10th century chan (zen) monk and is often associated with children. Sometimes referred to as Mílèfó (彌勒佛), as he is commonly seen as an incarnation of Maitreya, the future Buddha. Directly behind Bùdài and facing out of the other doorway is Skanda (護法韋馱尊天菩薩 Hùfǎ Wéituó Zūntiān Púsà). Skanda is a helmeted warrior and commander of 24 guardian deities. 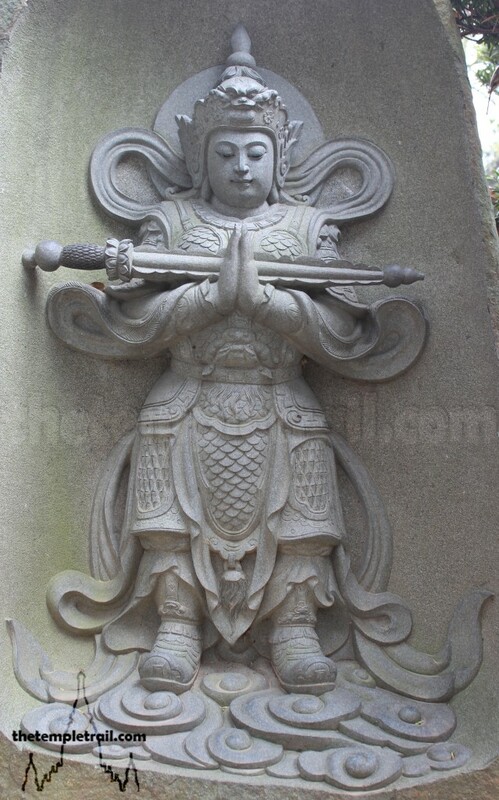 He is a chubby soldier who carries a vajra (lightning bolt) staff and is the protector of temples and the Dharma (teachings). He is closely associated with the Hindu war god Murugan and the bodhisattva Vajrapāṇi. Lining the left and right of the hall are four gargantuan grimacing statues. These are the Four Heavenly Kings (四大天王 Sì Dà Tiānwáng). The four kings are powerful guardian gods who defend the Dharma, protect the world and live in the Cāturmahārājika heaven. They are the generals of Sakra, lord of the devas (gods) and guardian god of Buddhism. The Heavenly Kings defend the devas from attacks by the asuras (angry gods). They are also the guardians of Buddha and the Dharma. 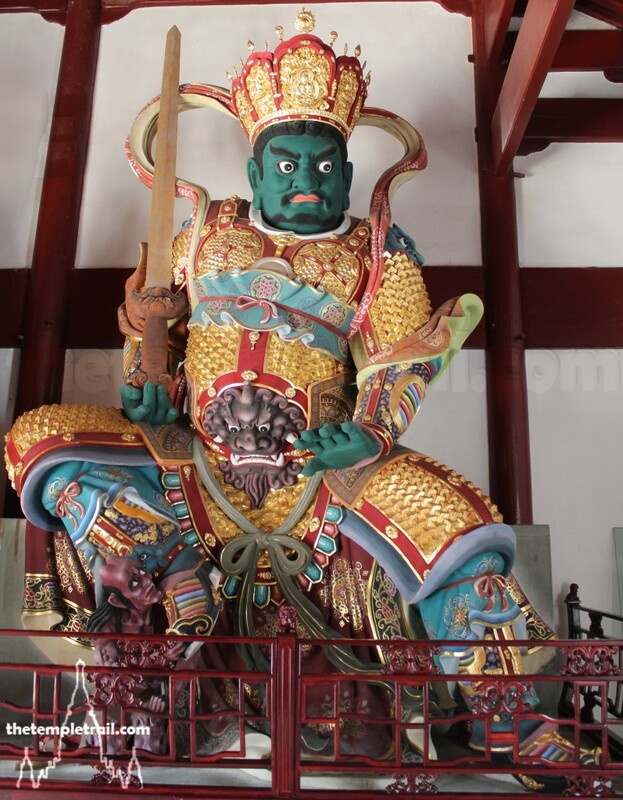 Vaiśravaṇa (多聞天王 Duō Wén Tiānwáng) is the guardian of the north and the chief of the heavenly kings. His name means ‘he who hears everything’ and he carries a Chhatra (umbrella) as a symbol of his status and a mongoose as a symbol of generosity. 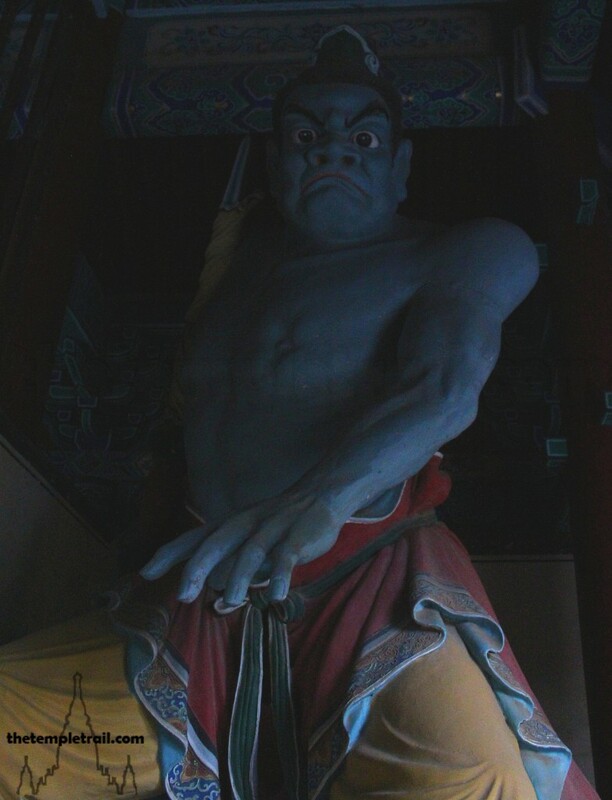 His skin is either a yellow, white, flesh-coloured or blue hue and he is the commander of the yakṣas (nature spirits or ogres) who are fearsome warriors. His umbrella darkens the battlefields and causes winds to blow at his enemies. The Chinese say he lives in a crystal palace. Virūḍhaka (增長天王 Zēng Zhǎng Tiānwáng) is the king of the south. His name means ‘he who causes to grow’. He wields a sword that he throws into the sky transforming it into lightning to defeat ghosts and monsters. He is often depicted as a grimacing blue, green or black skinned figure. He is the leader of the Kumbhāṇḍa (pot-bellied dwarves) and lives in a glass palace. Dhṛtarāṣṭra (持國天王 Chí Guó Tiānwáng) is the king of the east. His name means ‘he who upholds the realm’. He is the ruler of the Gandharvas (half-animal nature spirits); heavenly beings who are wonderful musicians. He carries a pipa (Chinese lute) and is normally flesh-coloured. When he plays his pipa, his enemies are deafened and suffer headaches. He lives in a golden palace. 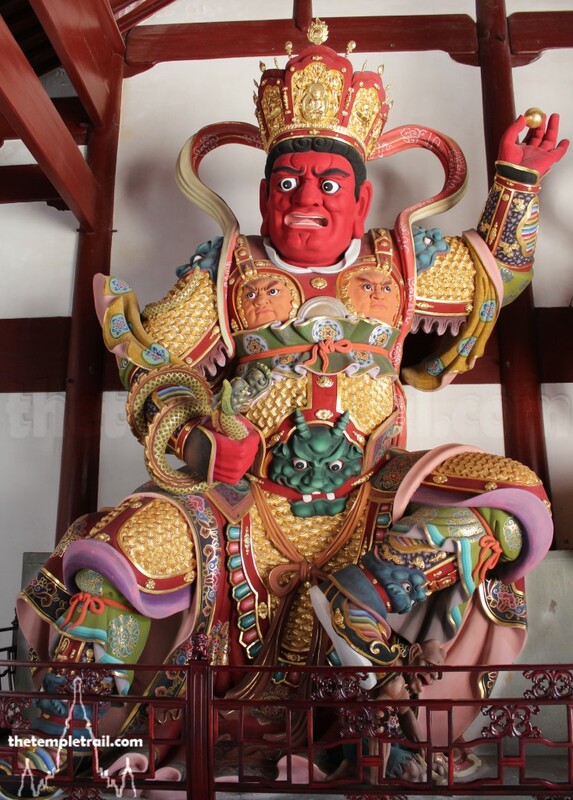 Virūpākṣa (廣目天王 Guăng Mù Tiānwáng), king of the west is a red-faced figure whose name means ‘he who sees all’. He holds a nāga (magical water snake) or dragon and a pearl. He sends his nāga into the clouds where it sprays water down upon his enemies. He lives in a silver palace and is the king of the nāgas. The main courtyard of the temple generally occupies the space between the Hall of the Heavenly Kings and the Main Chamber. If it is a smaller temple complex, the Bell Tower and Drum Tower can be found here. It will have an incense brazier for burning joss sticks located directly in front of the main hall. In some temples you will find sutra pillars and stelae in this courtyard. 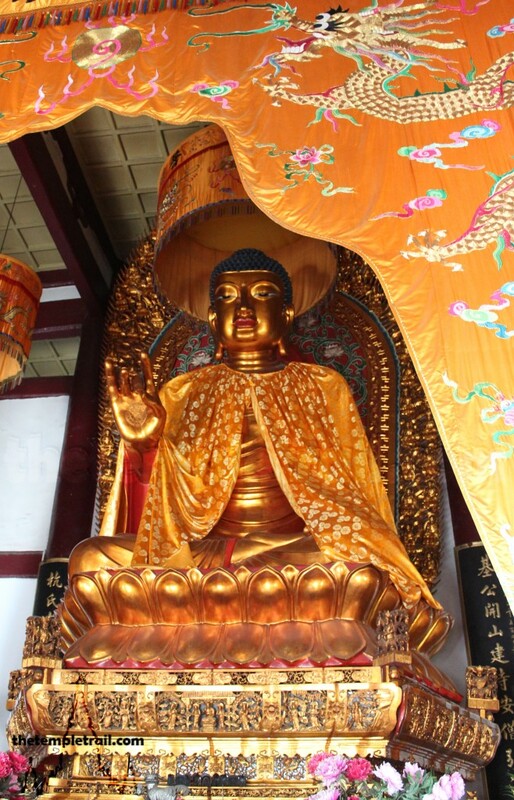 Temples can have any number of halls and chambers, but without fail, all have a main chamber that houses the most important Buddha image, usually Sakyamuni. The traditional set up has three main statues in the hall, all of which sit on Lion Thrones (the throne of the Buddha). The central figure is Sakyamuni and he is normally flanked by the Buddha of the Western Pure Land Amitābha (阿彌陀佛 Ēmítuófó) and the Medicine Buddha Bhaiṣajyaguru (藥師佛 Yàoshīfó). Sakyamuni is normally shown in a meditation pose and sometimes there are many smaller statues of him in front of the main one. To his right, Amitābha usually sits holding a jewel box to symbolise the precious teaching. To the left of Sakyamuni, Baiṣajyaguru usually holds a miniature pagoda or medicine box that contains healing herbs. In front of the statues is an offering table and various small items used for adoration such as a few musical instruments used during chanting, for example a bowl bell (磬 qìng) and a wooden fish percussion instrument (木魚 mùyú). The table will usually have a cushion in front of it for worshippers to kowtow their obeisance. 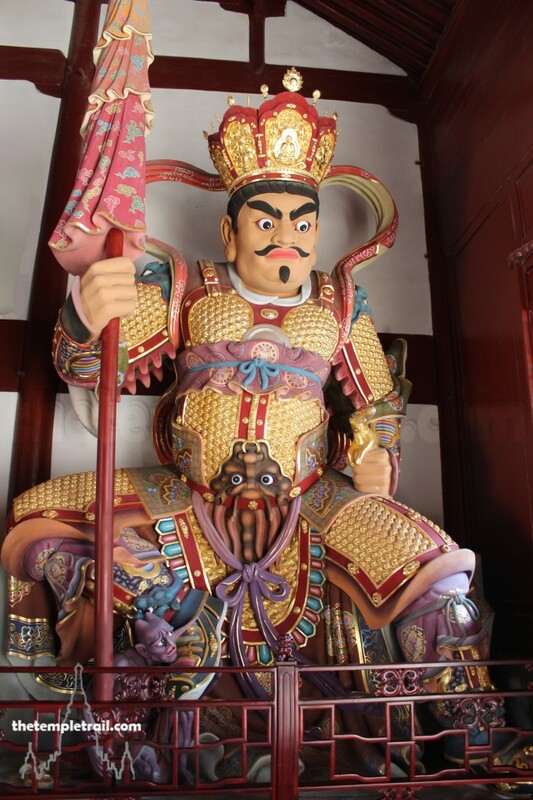 Sometimes, the hall will have a statue of Skanda and the historical general Guan Yu (關羽 Guān Yǔ) on either side of the entrance to protect the Dharma. The back two corners of the hall may have a statue of the universally worthy bodhisattva Samantabhadra (普賢菩薩 Pǔxián Púsà) on his elephant to the right and the Gentle Glory Bodhisattva Mañjuśrī (文殊師利菩薩 Wénshūshīlì Púsà) on his lion to the left. 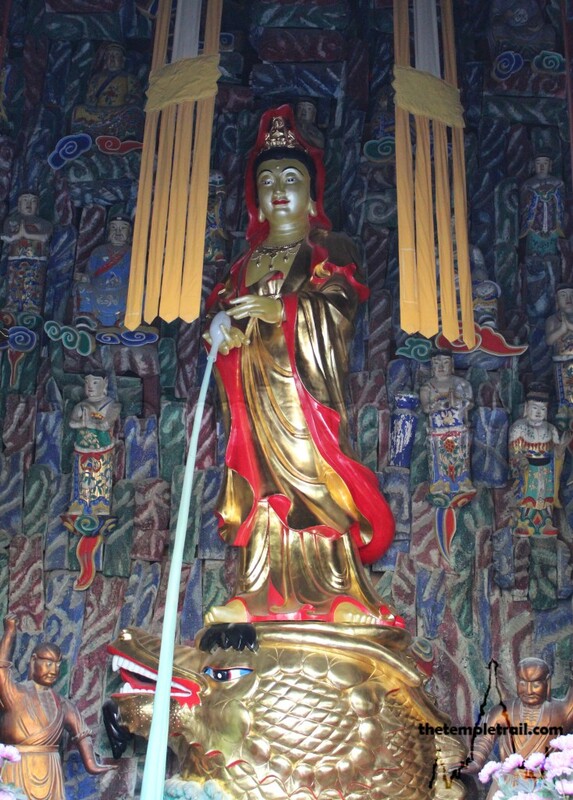 The hall will often be lined with statues of arhats (羅漢 luóhàn – enlightened followers of the Buddha) and behind the principle Buddha image, there is usually a statue of the iconic Chinese bodhisattva of mercy Guānyīn (觀音) standing on a sea monster against a screen filled with depictions of many holy beings. The main shrine hall is named differently in each temple. It can be called The Great Treasure Hall, The Grand Hall of the Great Sage, The Precious Hall of the Great Hero and so on. There is no set name for the building and the wonderful array of differing names adds colour to the basic temple formula. Larger temples will have a whole set of other shrines and chambers. Depending on the dedication of the temple, they could be for any of the Bodhisattvas. Most commonly, they include a Guānyīn shrine, a Samantabhadra shrine, a Mañjuśrī shrine or a shrine to Kṣitigarbha (大願地藏菩薩 Dàyuàn Dìzàng Púsà – Earth Store or Hell Bodhisattva). Sometimes there are shrines to important figures such as Xuánzàng (玄奘), the monk who brought scriptures back from India, and was immortalised in Journey to the West. The temple is framed by a set of cloister buildings that run the length of the temple grounds on either side. These rooms often contain small shrines to specific Buddhas or Bodhisattvas or function as shops. The temple refectory will often be located in these cloister buildings and you can get some vegetarian food for a nominal fee. The cloisters in some temples have the monks’ cells, or guest rooms for visitors. A walk along the cloisters will churn up a gamut of rooms with a number of purposes. The pagoda (塔 tă) is a stupa tower that is normally located to the rear of the temple, but can be found anywhere, if at all. 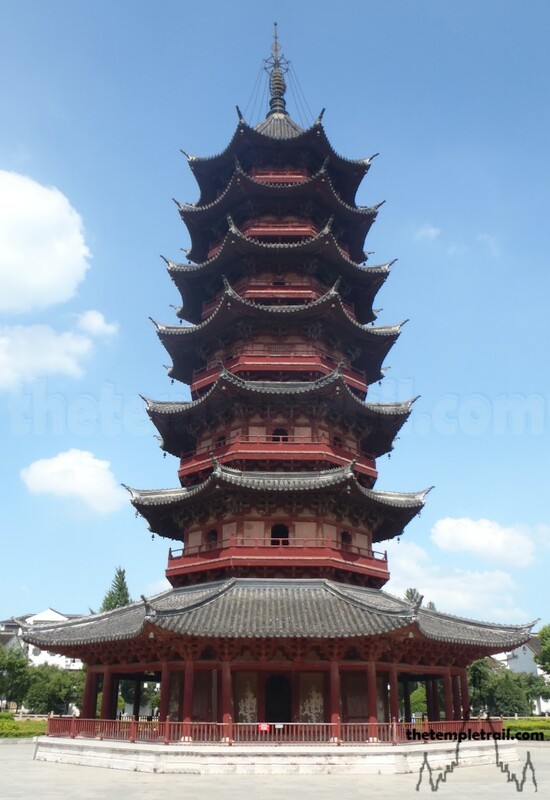 Pagodas come in many different shapes and sizes, but are usually a number of storeys and have a spiralling staircase that you climb to get to the top. Commonly, they are either square or octagonal. Sometimes there is a chamber at each level, sometimes not. 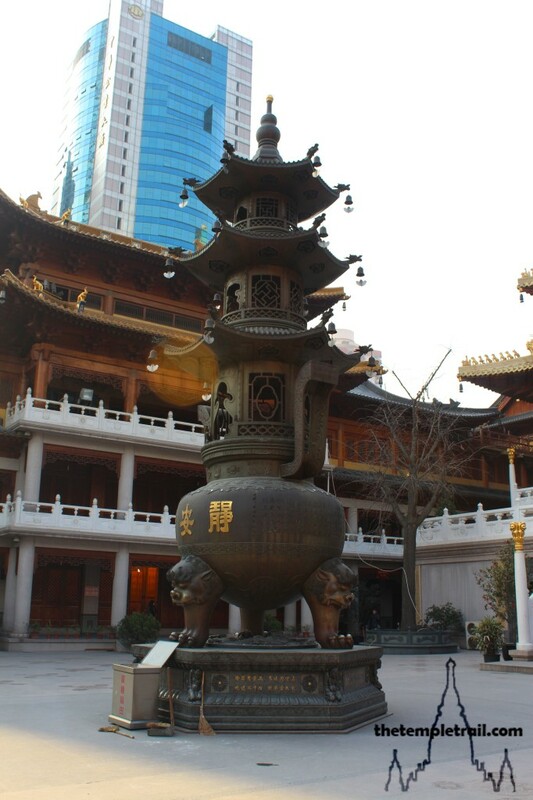 Some pagodas, particularly older ones, are made of solid stone and are not hollow or climbable. The pagoda is normally built over a reliquary that is buried in the ground. 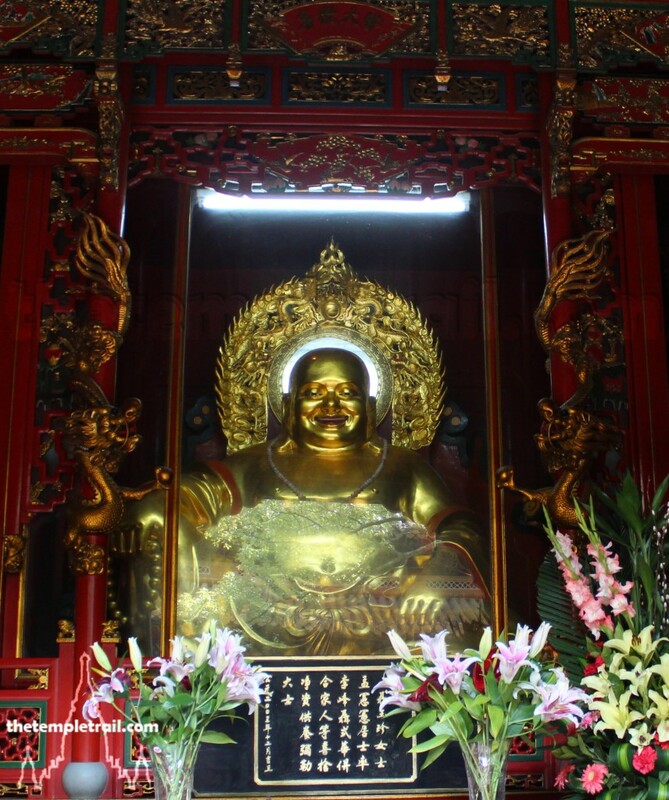 A Chinese Buddhist temple is a treasure chest of bright statues and interesting stories. As you enter you immediately feel transported to an exotic place filled with wonderment and strange imagery. Feelings of amazement, curiosity and perhaps a little fear will grip you while you wander through the various buildings. The emotional and sensory assault on your perceptions is part of the fantastic experience that awaits you. It should be noted that none of these figures are actual beings but simply a manifestation of the mind. 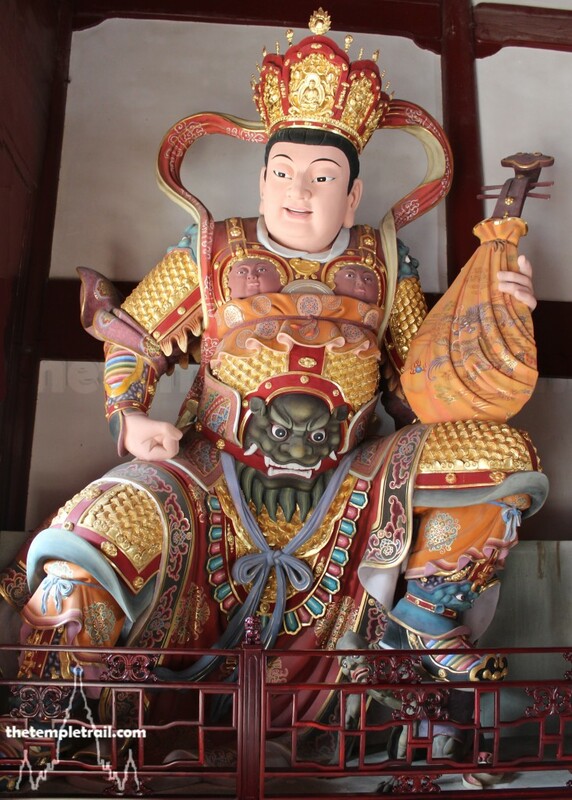 The problem can be with Chinese temples that many are mixed with Taoist gods and thus people get the idea that the idea that the imageries are of real gods.